All boots are just some sort of combination of leather, rubber, and laces. What makes a boot a tactical boot is that it was made for a special purpose. The best tactical boots are designed to specifically handle the rigors of certain duties. When you are selecting shoes, you want to make sure that they meet your needs. If you are a runner, you will need something light with a snug fit. And work boots should provide much-needed protection for your feet in case you drop something heavy on them. For your basketball shoes, you need something to support your ankles. 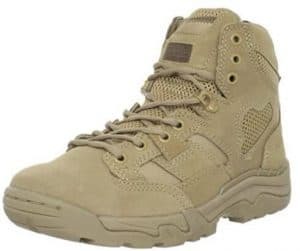 Well, tactical boots are no different than these shoes. There are quite a few different tactical boots to choose from. You are definitely going find a lot of options if you try to search online. One common mistake that most people make is that when they are buying these boots, they base their purchase on the price. Opting for cheaper cost almost always lead to a dissatisfied customer. This is because some boots are just made poorly. Cheap glue is used to hold the seams together and this allows water to seep through and the boots will fall apart after being used a few times. Other tactical boots are so uncomfortable due to a lack of padding. They make wearing these boots a chore. Hopefully, this article will guide you in choosing the best tactical boots available. Tactical boots are typically the kind of boots that soldiers. 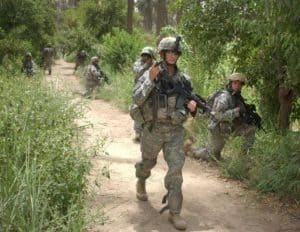 As opposed to during parades and other ceremonial duties, tactical boots are military boots designed to be worn by soldiers during actual combat or combat training. Soldiers have worn tactical boots in the battle for much of recorded history. The modern tactical or combat boots are designed to provide a combination of grip, ankle stability, and foot protection that is suitable for any rugged environment. These boots are normally made of hardened leather or chemically-treated leather, or both. Tactical boots can be waterproof. The variations on the basic lace-up tactical boot have been designed for special types of troops like the tanker boots and jump boots. Also, the boots that were designed for special environments are the jungle boots, desert boots, cold weather boots. The recent tactical boots are beginning to integrate kevlar and nomex within their side panels. This is to provide better protection and ventilation for the skin of the army men and women who wear them. It is also good that you know the basic parts of your tactical or combat boots. This guide will help you identify the important parts of your tactical boots and help you understand what each part is made of and its specific purpose. 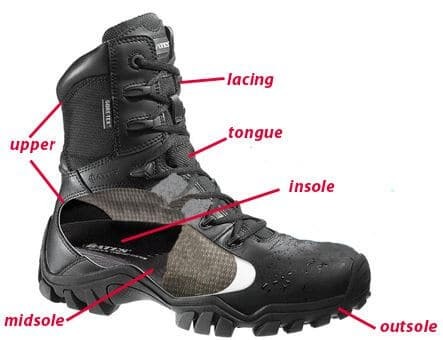 Take a good look at the illustration and get to know the parts of a tactical boot. The whole top portion of the boot is called upper. The covering or the face of the boots. It is responsible for holding the foot and protects it from scratches. This part should be properly attached to the sole with a high quality, durable and perhaps waterproof material. The materials that upper is made of directly affect its weight, durability, breathability, and abrasion-resistance or water-resistance. Most of the time, uppers are made of full-grain leather, split-grain leather, nubuck leather and synthetics. A full-grain leather is also known as just “leather”. This kind scores well in resistance to abrasions and water. The maximum durability is also part of the package. Full-grain leather will lack breathability and breaking it could take a while. Rough terrains, heavy loads and long hikes are the circumstances for this type of leather. The downside of full-grain leather might be the fact that it dries out slower than synthetics. And you might need a good boot dryer for it. This is a combination of leather and nylon for lighter weight and improved breathability. The split-grain leather is considerably cheaper. However, it scores lower for the water or abrasion resistance aspect. The nubuck leather is a buffed leather for suede resemblance. This is pretty much the same thing as full-grain but with a bit more flexibility to it. This consists of polyester, nylon and synthetic leather. They take less time to break in than leather. Synthetics are lighter and will dry faster compared to other leathers mentioned. They are also cheaper in comparison. However, synthetics then to start to wear much faster. Waterproof tactical boots are usually made of modern synthetic materials. We now move on to midsoles. These are the padding and inner linings inside. Midsoles improve the shoes’ cushioning. They act as shock buffers and determine the overall stiffness of the boot. A padded tongue is always good. Midsoles are responsible for the comfort of your feet inside. And they help with ventilation and sweat control. Midsoles are usually made of one of the two materials the EVA and Polyurethane. This material feels lighter and cushier. It is the cheaper alternative and happens to be the more used. It is also shock absorbent and waterproof. EVA offers good protection from sharp objects too. This one is sturdier and firmer than EVA. Polyurethane may be more durable but it can also be more costly. It is the modernization of the materials used that allowed for the tactical boots to be used even for hiking. The outsole is the bottom of your boot. It is the one transfixed to the ground and is responsible for the protection against objects below. Outsoles must have a good compound make-up and rough pattern so that it will grip harder and can dissipate water, especially on a soft slippery trail. The soles of tactical boots are mostly made of rubber. There are some other materials such as carbon that might be added to provide extra stiffness. But that is not a regular occurrence. You might want to watch out for Vibram soles. If you ever see a yellow “Vibram” emblem on the bottom of a tactical or combat shoe, do know that it’s definitely a good thing. Vibram soles are a high-quality option made in Italy and have almost become an industry standard. The main benefits of Vibram soles are being resistant to a great number of industrial substances. It also makes tactical boots resistant to oil and slipping. They are non-marking, durable and lightweight. Lacings are the locking mechanism of your tactical boots. The laces should be durable and the lacing style should not easily loosen. Also, it must be easy to tie and stay tied. And must quickly come undone when necessary. Some laces are made of plastic to further waterproof the design. The brave men and women in the police and military are always ready to safeguard the integrity of our homes and our country. They constantly put themselves in danger on a regular basis with immense nerve and courage. It is only very important for police officers and soldiers to wear the right type of gear to carry out the job with more effectiveness. While a bulletproof jacket will save them from gunfire, tactical boots will keep their feet away from immense pain. Tactical boots or combat boots are designed to protect their feet from extreme stress. Tactical boots are also worn by outdoor enthusiasts. They are made for rocky terrains and support your ankles like no other boot probably can. 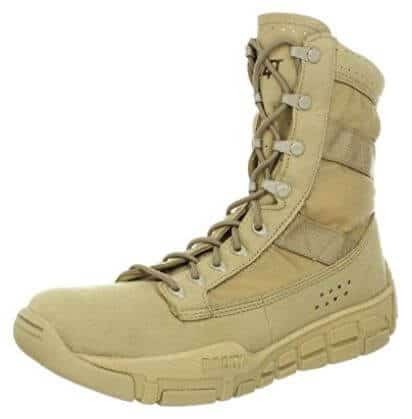 Tactical or combat boots are special footwear that is designed to provide a combination of grip, ankle stability, and foot protection that is suitable for a rugged environment and challenging terrains. As mentioned earlier, they are traditionally made of hardened leather and waterproofed textile materials. 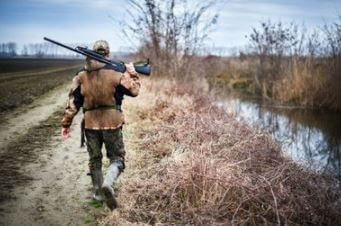 When it comes to tactical boots, there is an everyday use which is also for recreational. Then there is also for the military and law enforcement use. Each category of boots has their unique properties that are fitting to their intended uses or purpose. But, there are many general benefits that you can enjoy from a great pair of tactical boots. Tactical boots are guaranteed your top choice if your ankles are prone to injuries or have already been injured before. Tactical boots will definitely keep you well protected with added support and stability. You should also wear tactical boots if the load you are always carrying is heavy for your blood type. You can also benefit from these boots if you are taking a long hike or a slow hike over a challenging terrain. Tactical boots are also great if tweaked knees are a major concern for you. Also, for beginners in outdoor activities, wearing tactical boots is beneficial to you. Since the muscles in your legs are not yet strong or developed enough, you will need some added support. In this guide, we will discuss with you further the wonderful benefits you can look forward to from tactical boots. Tactical boots are made to be lightweight. This quality makes them very comfortable and very flexible to make sure that you will fit into them smoothly. It also ensures and allows to adapt to your feet very quickly. Tactical boots will always assist you in your activities. Its being lightweight allows you to wear them for a long time while staying comfy and lessening your experiencing fatigue. Because of its design characteristics, tactical boots are energy saving. And let me tell you why. Tactical boots provide you with many energy-saving features. This allows you to wear them for a longer time, walk and run for long distances without it having any negative impact on you. With every step, your energy will be conserved as the shock absorption feature plays its part. These boots will give you foot strength. They provide the ideal material and amount of padding that you need to activate different ligaments and muscles that you have not been using all along. The result of this is strengthened feet and legs. Tactical boots need to be heat, oil, mud and water slip resistant. Because sure footing is key. Heat and oil-based environments will fail to provide any challenge for a good pair of tactical boots. These boots will allow you to work in different environments without being affected. As a result of tactical boots’ lightweight and energy saving nature, you will gain speed and agility. This feature is very crucial for people who always need to have the edge over others. The best tactical boots will provide you with a natural gait due to the midsole and the outsole construction. This will allow you to fully activate your muscles like the calves, hamstrings, and glutes. 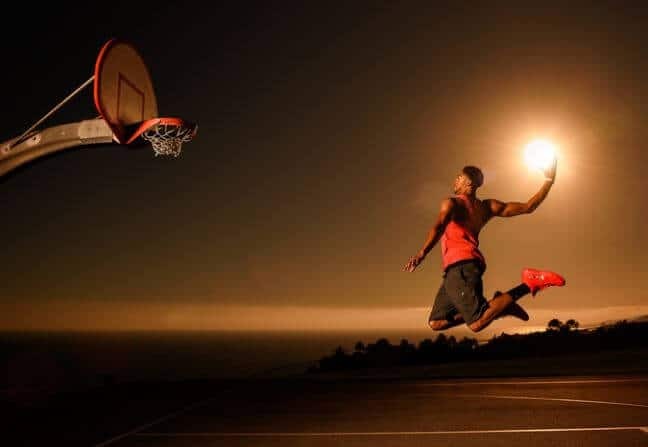 In general, you will be left with adamant legs, which is what you really need to take your performance to the next level. Standard issue tactical boots are your basic iteration of army boots. These boots are waterproof and are commonly made out of black leather which provides water resistance and is usually hardened. Its overall design is envisioned with extra ankle or foot stability in mind. They are made to adapt to rough terrains that you might encounter in training or combats. Also, standard issue combat boots are universal so these can be used as hiking boots. These are your regular army boots, a Jack-of-all-trades of sorts. The military is very picky about the brands they allowed as “standard” issue. Jump boots are also known as paratrooper boots. They are a standard equipment for parachute units for a very long time. There are a number of features added. The ankle area is reinforced to serve the user better. The heels are airborne optimized and soles are made of rubber. The toe caps are also added in order to enhance protection. If there is a need for you to jump frequently on uneven terrains, then jump boots are your perfect choice with the necessary support and protection present. You might hear jump boots being referred to as “Corcoran”. This was the name of the original manufacturer. Tanker boots were designed to meet the specific needs of a tank crew. These boots were developed after General George S. Patton, Jr. established Tank Corps in the United States to fit a tank crew’s certain needs. Tanker boots do not have laces. There are leather straps instead. Meaning to say, there is nothing to tangle with the moving parts of tank or tree roots, branches or wild foliage. They are also heat resistant which means there’s no sweat. There are other features also present like steel toe guard and other metal inserts to maximize protection levels. The package also includes the gusseted tongue, steel or plastic guards for heels and shanks. These boots are the perfect choice if you are traveling in a forest-heavy area packed with step-impeding branches and tree roots. The steel reinforcements are good at handling sharp rocks that you may encounter on your journey. 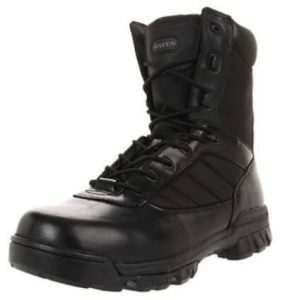 In addition to the three types of tactical boots mentioned, there are also three types of boots for extreme weathers. Desert boots are made after the Saudi Arabian recipe by Norman Schwarzkopf. 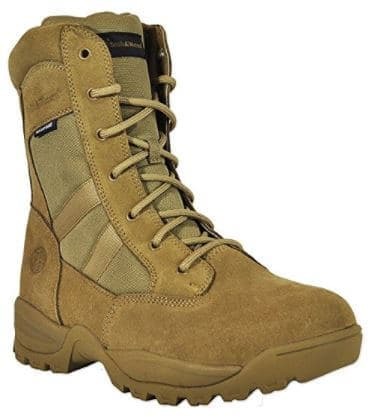 These tactical boots are made of rough suede with nylon laces or sidings. Jungle boots feature uppers that are made of canvas paired with rubber soles weighing approximately three pounds. The desert boots are designed to quickly get rid of excessive heat and the steel protective inserts were thrown out. Its drainage vents were eliminated too in order to stop the sand from getting in. These combat boots are designed to allow the water get out quickly and dry out as soon as possible. You may think they’re excellent at preventing water from getting inside but that is not the case. With jungle boots, water drainage is achieved through specialized eyelets. It has a woven mesh footbeds that allow air to circulate freely and get rid of the leftover moisture. The less time your feet remain wet, the fewer possibilities for blisters and tropical ulcers arise. There are also tactical boots for cold climates. 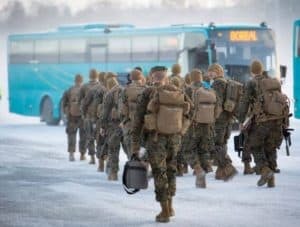 Tactical boots for cold climates are either solely water-proof that are made for harsher weathers or are made to tackle climates below -20 degrees. In addition, these types of boots insulation are made of wool and rubber to keep it secure. As in every decision making when buying shoes, weight should be an important decider. Choose lightweight tactical boots where possible but keep in mind that it must still support your needs. The lighter your boots, the less work for your legs. Depending on the environment and activity you are likely to frequent, it is best to choose something that can tackle it with ease. You do not need for overkill though, as this will only make your hike more difficult than it needs to be. After choosing the intensity of your trail, activity or knowing your own potential, you should then decide whether you need lightweight, mid or heavy boots. Unless you’re going to fight a war, you need to choose your tactical boots based on their weight, design, and materials used. You can choose a lightweight and flexible leather tactical boot, over the hard and heavyweight variants. Most tactical boots manufacturers tend to make their products bulky and uncomfortable by adding features to the boots that are not necessarily “essential”. This will become the main root cause of tactical boots being inflexible which will make you end up feeling like you were carrying heavy chains on your legs. Comfort has to be the most important factor of all. After all, your duty, combat or maybe backpacking trips and trails can be tens of miles, meaning you will be wearing those boots for continually long stretches. The best tactical boots will let you enjoy your time without feeling any burden. This will be thanks to a good padded inner and sock liner, shock absorbing midsoles, seamless uppers and much more. If required, say you have low arches or flat feet, change the insoles for custom orthotics. However, most standards, fitted EVA, gel and memory foam insoles are more than suffice for the masses. Design-wise, you may go for cushioned footbeds and top-quality midsoles that will give you a more comfortable sensation when walking which is essential for most tactical boots users. Weight and comfort are not the only important factors to keep in mind when buying your tactical boots, durability must also be the heart and soul of every purchase you’ll make in your entire life. There are many tactical boots in the market made of good leather but have severe design flaws which can be problematic. Tactical or combat boots with these kinds of flaws tend to be damaged earlier than the properly engineered ones. This affects the lifespan of your tactical boots as well as endangers your walking posture, leg structure and causing stress on your ankles and knees. A bad design will ruin the boot sooner or later even if you bought tactical boots with the best quality material. Shoe designing is more like a combination of the arts and engineering which make a huge impact on the durability of your tactical or combat boots. From the kind of stitching method used to the shape of the sole to the actual construction process, There are many aspects to proper shoe designing. You will have to check the kind of stitching method used, the shape of the sole and basically, the actual construction process. Therefore, it is really necessary for you to check the design and materials used on the tactical boots before buying. The best tactical boots have a full or gusseted tongue. The right tongue will help you in avoiding things like debris that will accumulate in your shoe. This is still true even if lesser things like water. The last thing you want inside your boots is unwanted crap. It also has the benefit of keeping the tongue consistently in the same spot, so it doesn’t get twisted. And it won’t annoy or distract you from the job at hand. If you are looking for something stable and substantial, be careful when choosing an EVA midsole. The EVA is a great material for tennis shoes and trainers. But it doesn’t always fit the bill if you need stability. Look for polyurethane too to avoid over compression. Also, look for a material that is stout enough to handle a heavy loadout. And if it is an option, rotate between boots and don’t wear the same pair on consecutive days to reduce the wear on them. That curved design of the sole of the boot around the ball of the foot in most boots makes it easier to use the boots. Your feet will be less fatigued since you won’t have to fight the boot shape as much with every step. Not all tactical boots have this rocket shape or curved design but either one can be a great boot. Generally, the heavier your boot and the more you will rely on it for stability, the more you’ll want that curve. The 5.11 tactical boots are greatly known for their durability, safety, comfort, and strength, apart from its reliable securing system. 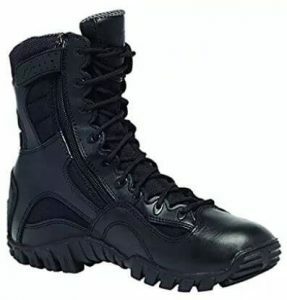 The company that designed these boots offers a broad range of police duty boots. They come with patented Shock Mitigation system and several other categories. One of the many reasons why the ATAC always make it on any list of best tactical boots is the fact that it was engineered to meet the rigorous demands of the law enforcement, tactical operators, and military personnel. You can tell the ATAC has been tested by battle from its long shafts all the way to the slip-resistant outsole. The boot is just the ideal weight for police and military work. The 5.11 ATAC boots will provide you all the additional support you need in the form of injection molded Phylon midsoles. It is combined with a non-metallic shank so you have everything you need to stand all day without even fidgeting. Nothing can drain a cop or soldier more than having to work on their feet all day. The Belleville TR960Z Tactical Research Khyber Ltwt Black Side-Zip Boots are made with the toughest materials and the most durable leather known to man. We are talking about full-out, full-on, full grain cowhide leather and not pigskin. This cowhide leather is engineered to last multiple lifetimes. Note that the rock-hard leather uppers incorporate a little nylon fabric for just the right amount of flexibility that you will need. It’s a delight how these boots meet safety standards for your duties. You’d be surprised just how many different types of chemicals cops run into. Although, these are not some of the most common compounds that policemen or soldiers find themselves battling. It is a good thing that the Belleville TR960Z Tactical Boots are ASTM rated and certified as oil, petrol, and lubricant resistant. 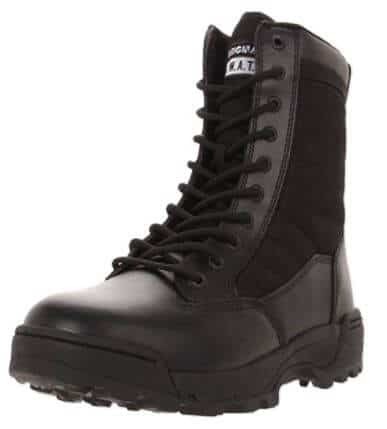 The Maelstrom PATROL Black Duty Tactical boots with Zipper provide impressive protection at a great price. It’s true, this has got to be the best value lightweight tactical boot. These Maelstrom boots are great for the outdoors. They have protective features that come with rubber outsoles that are water and oil resistant. You’ll definitely won’t trip and fall with these tactical boots. In addition, these boots came with a breathable, moisture-wicking lining that will keep your feet smelling fresh even after walking in the wilderness for almost 5 hours. Maelstrom PATROL Black Duty Tactical boots with Zipper were engineered to achieve the comfort you need. The designers and engineers at Maelstrom understood the fact that law enforcement officers, security personnel, and work professionals all over the world share a few but important similarities, like 12-hour-long work shifts and super extensive walking distances. That is why key features such as shock absorbent cushioned inserts which provide your feet with a comfortable experience are added. Another thing, this model came with a zipper for your convenience. This removed the whole frustrating trouble of laces coming apart during motion. This added feature is something that most tactical boot users love and enjoy. Lastly, the engineers of these boots incorporated supportive design elements such as composite shanks that are combined with flexible rubber outsoles made my walking experience so much comfortable! You will be astonished at how comfortable these boots are. These Under Armour tactical boots came with very nice lightweight features. First of all, its TPU shank offers a great mid-foot support that will prevent you from getting injured. This can be attributed to its great reinforcement features that will allow you to make any movements without forcing the boot’s structure. 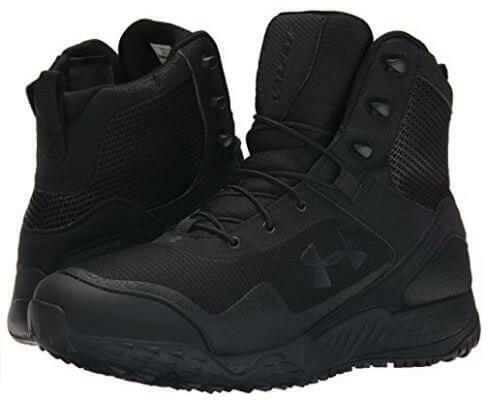 These awesome Under Armour tactical boots were made with the so-called “Micro G Foam”. They are responsible for making you feel as if you are walking on air. These will also provide you with great support especially when you test these boots to jump or run around. The entire length of the boot is made with the widely known “UA Clutch-Fit Technology”. This served to reinforce the boot’s endurance at the same time being really flexible and lightweight. 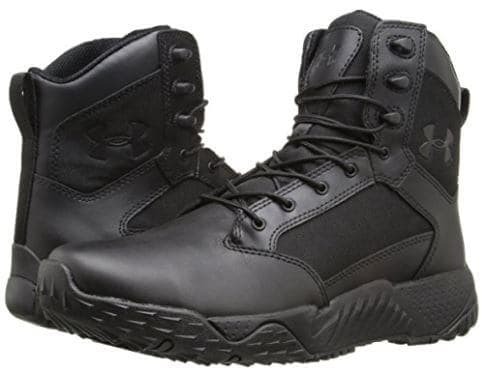 These Under Armour Men’s Valsetz RTZ Side-Zip Tactical Boots offer convenient protection for your feet. The outside of the boot is made of welded synthetic fabric which makes the whole tactical boot abrasion-resistant and generally rough. Lastly, the inside of these Under Armour tactical boots is designed integrating molded ortholite sock liners made of memory foam in the top and with a PU base. This add-on ended up making the boots highly breathable, moisture resistant, lightweight and conveniently easy to wash. The C4T Tactical Boot is another great pair of tactical boots from Rocky. Like most manufacturers of tactical boots, Rocky knows what it takes to develop a boot that can keep up with an active lifestyle. Rocky has a dedication to providing a quality product that is made from the most durable and environmentally sustainable products that this company can find. 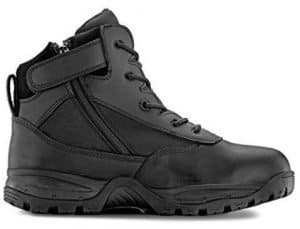 These boots were designed after seeking contributions from the men and women who use tactical boots to their fullest in some of the most difficult situations you can imagine. Rocky was able to make a tactical boot that offers a viable solution to a wide degree of different situations. This Tactical Boot is an affordable boot that offers a wide array of great features. On top of this, the boots come with speed laces and NATO hooks. These are essential not only for your convenience but also to secure a tight fit that would save you from possible falls on uneven surfaces. The most important thing to note about these boots is that they are made entirely from synthetic materials. The material used in these boots is a 900-denier nylon and polyurethane blend. And the great thing about this material is that is very easy to clean, unlike polishing leather which takes up more effort. Another key feature of this tactical boot is that it is intended to be lightweight. In terms of durability, it is obvious that the Rocky designers and engineers dropped some serious knowledge when conceptualizing these boots. Rocky’s C4T Tactical Boots were made with a combination of quality leather, rubber, and fabric. This does not only give it an awesome look but it also achieves in giving you that lightweight experience. These Rocky tactical boots come with rubber outsoles that offer superior traction. This will prevent you from sliding off while you are in action. Finally, these boots are also water-resistant. When you wash them off, they dry up quite fast. Not only is it convenient on your part, but also protects you against tough external conditions that you may encounter in the wilderness. This pair of lightweight tactical boots combined such awesome features in this amazing protective package. 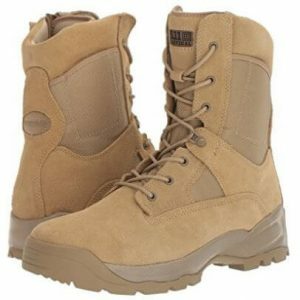 To begin with, 5.11 Tactical Taclite 6″ Boots ankle is made mainly of perforated EVA foam padding. This does not only make the boots lightweight but this makes them comfortable too. These boots also have TPU ankle stabilizers that reinforced the boots’ structure. The strongest suit of these boots is their protective features. On that aspect, these 5.11 tactical boots have awesome rubber outsoles with superior multi-directional traction lugs that provide the proper traction. The 5.11 Tactical Taclite 6″ Boots also have compression-molded midsoles. You can thank them for an awesome shock-absorbing quality that will make your experience so much better. Additionally, the tactical boots’ sides have vents which make them ideal for using in both hot and humid climates. Apart from that, they had their insides made with ortholite sock liners famed for their moisture wicking and anti-bacterial qualities. To wrap up the Taclite boots’ incredible comfort offering, 5.11 incorporated a feature called “Zonal Lacing” that is in-charge of letting the boots fit tightly on your feet. This ensures proper fitting throughout the day, without sacrificing flexibility that’s essential for all tactical boots users. The company that created these boots is known for the outstanding quality and attention to fine detail. Smith & Wesson is proud to introduce a boot that sets a new standard for construction, durability, and price. The Breach 2.0 is built upon years of top-caliber manufacturing and industry experience. The leather and nylon construction of Smith & Wesson Breach 2.0 Men’s Tactical Boots is made to provide full protection without compromising on comfort. A gusseted tongue keeps dirt and debris out so you won’t be bothered with crap that gets in your boot. This company really made sure that you will be comfortable all day. An EVA Midsole is added which provides lightweight comfort and cradled support for your precious feet. And for added support, Smith & Wesson used a steel shank. Board-lasted construction creates a torsional rigidity that reduces foot fatigue during long work shifts. This Tactical Boot is slip resistant. The rubber outsole is engineered to minimize traction loss with an innovative pattern that grips dirt, waxed surfaces, fences and ladders, and anything the urban jungle can throw at you. This model provides high-quality construction at a budget-friendly price. It gives you the best bang for your buck. Whatever your trade is, if you are required tactical boots that you can count on, the Breach 2.0 works hard like you do to outperform and outlast. Bates Ultra-Lites have proven to be an invaluable asset to the uniformed personnel for over ten years. They are serious tactical or combat boots. 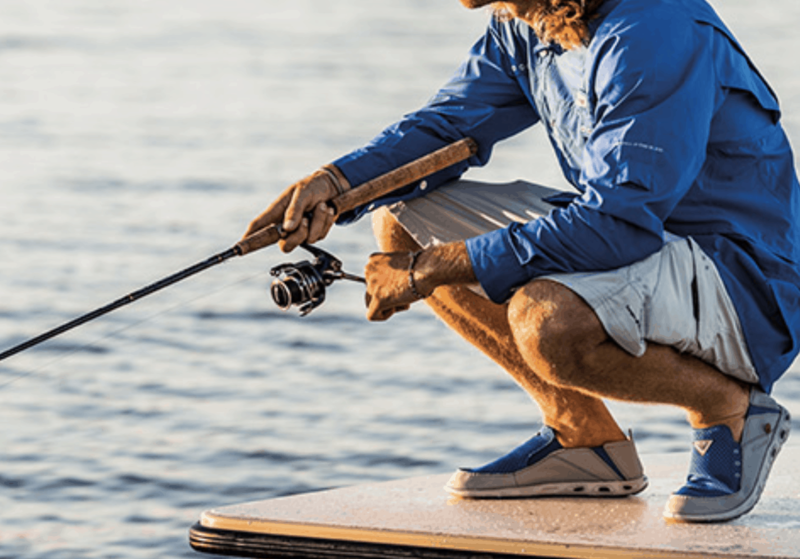 The Bates Boot is committed to providing quality, comfort, and performance. This tactical boot keeps your feet warm and dry through all your excursions. Their 8 Inches Tactical Sport Side-Zip Boots greatly perform under pressure. They are built with high-quality leather uppers and 1680 denier ballistic nylon. These boots have flexible athletic construction, and classic styling. The Ultra-Lites effortlessly take you to anywhere your duty takes you. The boots by Bates meet all the requirements that any police officer may have. It doesn’t matter if you take your beat in rural areas or more urban places. These bad boys will take you from your car to the streets and then to the mud. Plus the more the pressure builds, the better the Ultra Lites Perform. The Bates Men’s Ultra-Lites Tactical Sport Boots are packed with so much comfort that they almost feel like sneakers. I’m talking about compression molded midsoles with highly cushioned EVA footbeds that absorb virtually every ounce of shock. Combine that with the Velcro zipper strap and padded collars, and you have one of the most comfortable police boots on this list. The Under Armour Men’s Stellar Tactical Boots is one of the most popular tactical boots for police duty. Aside from its smooth, black and durable exterior, you can see the brand’s logo printed right there on the side and shafts. You can’t miss that the Under Armour Men’s Stellar Tactical Boots mean business. The name itself tells you all you need to know about these 900D nylon and leather uppers that are built to act as your own power armor. There will be times when the duty will take you to greater heights and other times, unimaginable depths. That is why cops will be excited to hear about the waterproof capabilities of these boots. However, if you think that that is where the protection ends, then you’re wrong. You have to know that these boots have great safety features. Under Armour takes the safety of our men and women in the police force very seriously. The reason why the Stellar Tactical Boots come with a plethora of safety and protection features. These include the TPU Shank incorporated in the EVA midsole for an extra sense of security. And other safety features include a quick-drying design that will keep water at bay as well as an Anti-Microbial Ortholite sockliner that can prevent the buildup of odors and severe infections. The Original S.W.A.T. Men’s Classic 9-Inch Tactical Boot is all about convenience and simplicity. As with all other classics, the simple appearance has become somewhat of a proven go-to for a personnel of law enforcement. This convenience also shows itself in the polishable full grain leather and 1000 denier nylon uppers that contain no metal for improved durability and comfort. Air cushion midsoles are included to keep your feet more comfortable than any sneaker. Just underneath these plush midsoles are nylon shanks that not only give your arches all-day support but also protect your feet from punctures. This means that airport police and officers in federal buildings can comfortably walk through metal detectors without setting off any bells and whistles. These boots are notable for functionality and support. Its features include custom molded thermoplastic heel counter and toe box for instant comfort and lateral support. The outsole is also as functional as it gets thanks to the waffle traction and ladder grip control for when you need to leap above and beyond the call of duty. Now that you have reached this part of our ultimate guide to finding the best tactical boots, we hope you’ll now be able to choose the best pair that will suit your needs. Before you leave, allow us to give you a few more tips. While trying out your new tactical boots for size, you will have to wear your favorite type of socks because most likely, you are going to wear them. Do remember that the thickness of your socks may play a major role in your overall experience. When putting your tactical boots on, do not tighten up the laces. Your index finger should effortlessly slip between the back part of your leg and of the boots. You should feel your heel moving toward the back part of your boot, when lacing up. Now, you can give them a quick test by walking a bit. If your toes are touching the front of the boot, that is a big red flag. You’ll hurt your toes throughout your ordeal. Another most important points is that your heel should move together with the boot. If the two are rubbing against each other, you may have to keep walking towards another model or size.